The toll for a solo driv­er along the In­ter­state 66 cor­ri­dor hit $46.75 dur­ing the Wednes­day morn­ing rush, ap­proach­ing a record high. On Feb. 28, the toll along the east­bound stretch of I-66 hit $47.50. The tolls are paid by driv­ers who choose to ride alone and are based on a dy­nam­ic pric­ing sys­tem, which chan­ges the rate every six min­utes, based on speed and traf­fic vol­umes. Many driv­ers — and some poli­ti­cians — have com­plained a­bout the fluc­tu­at­ing and high toll rates. The toll runs along 10 miles of I-66 in­side the Beltway in Northern Vir­ginia. Car­pool and pub­lic trans­por­ta­tion vehi­cles don’t pay the toll. 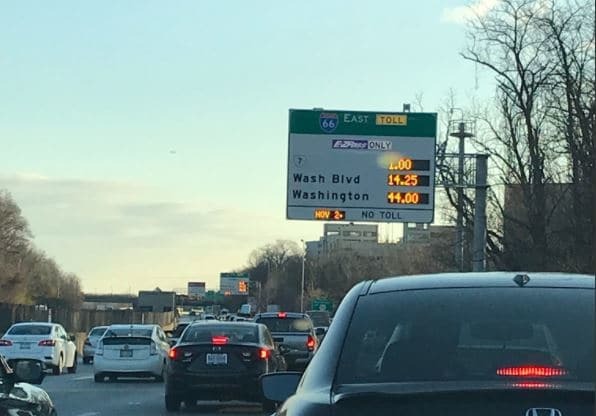 Toll hits $46.75 on I-66 lanes inside the Beltway – The Washington Post.